Provided you haven’t been living under a rock the past decade, you should know who Darren Sproles is. Sproles probably carries the torch as the best player of the decade in the Sunflower Conference and maybe the all-time torch in the conference. Sproles began his illustrious career for Olathe North as a sophomore at the running back position. Sproles showed flashes of dominance but spent the season as the back-up to Olathe North’s then All-State running back, Beno Gore. 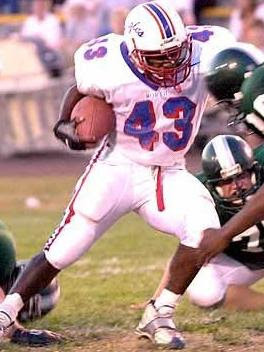 Sproles contributed key runs throughout the season and helped Olathe North to win the 1998 Class 6A State Championship. Sproles compiled 741 yards rushing that year, an astounding number for a sophomore second string running back. With one rock on his finger Sproles came back for the 1999 season primed to show the state his talent and get the Eagles back to another state title game. Sproles and Olathe North compiled a 6-1 record before facing Olathe South (also 6-1) in the second to the last game of the season. A playoff berth was on the line. Olathe North was trounced 31-8 by the Falcons. The lone bright spot of the game for Olathe North was a 45 yard halfback toss play from Sproles to Jessie Gullotta. 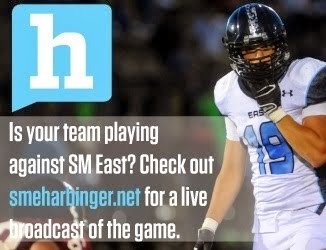 Sproles and the Eagles crushed Olathe East 54-6 the following week, but Olathe South won as well. Olathe North’s string of 3 straight state championships was ended, and Sproles and the Eagles were forced to sit out of the playoffs with a 7-2 record. For the season Sproles came away with 2,031 yards rushing, an average of 225 yards per game. Sproles was named All-State Class 6A, Kansas Top 11, KC Star Player of the Year, and was named First-Team All KC Metro Sports. However, the best was yet to come. Sproles came out for the 2000 season fully recharged and ready to wreak havoc on the state of Kansas. Sproles scored five touchdowns in Olathe North’s first game of the season, setting the tone for how the year would be. Olathe North ravaged every opponent on the schedule and a majority of the time Sproles collected most of his yards in the first half of the games. Olathe North completed a perfect season going 12-0 and winning the Kansas 6A State championship. In the three playoff games alone the Eagles outscored their opponents 154-7, including a 42-7 thrashing of Manhattan for the state title. The 2000 Olathe North football team was probably the best Sunflower Conference team of the decade, and Sproles was likely their best player. During the 2000 season Sproles rushed for 2,485 yards and 45 touchdowns. He also caught four touchdown passes. Sproles was once again named All-State Class 6A, Kansas Top 11, and the KC Star Player of the Year. He was named the KC Metro Sports player of the year, and won the Simone Award as the best high school football player in the Kansas City Metropolitan. Sproles finished his career at Olathe North with 5,230 yards rushing on 8.4 yards per carry and 79 rushing touchdowns (the 79 rushing TDs were a Kansas high school record until Salina Central’s Jake Sharp broke the total in 2005). Sproles elected to play at Kansas State University. At Kansas State Sproles was a First-Team All-American selection and took fifth place in the Heisman voting in 2003. He set the career record for rushing yards at KSU before graduating in 2005. Sproles was selected by the San Diego Chargers in the fourth round of the 2005 NFL draft, and has gone on to become one of the league’s top return men in addition to playing a backup role to LaDainian Tomlinson. legend and there couldn't be a nicer person! by far the greatest running in the school history and top 5 in the state ever hey if you had to list your top running back in olathe north history how would you rank them?